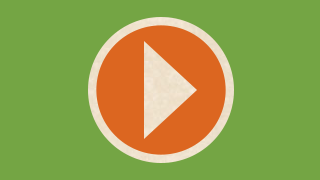 Tour Princeton's campus virtually or in person to learn about the University’s progress toward reaching its sustainability goals. Located in the Frist Campus Center, Café Vivian offers organic, sustainable and local food in a relaxed environmentally conscious atmosphere. Installed in 2012, the GreenSpace is a fully interactive exhibit that features sustainability research and initiatives at Princeton. The space itself is constructed of reclaimed wood from a fallen Princeton oak tree, and reused campus limestone, slate, and aluminum cabinet edging. The GreenSpace was also constructed with non-toxic, water based sealers and adhesives, and detailed with natural pigments. Founded in 2008, the Andlinger Center for Energy and the Environment supports research and teaching in sustainable energy development, energy conservation, and environmental protection and remediation related to energy. 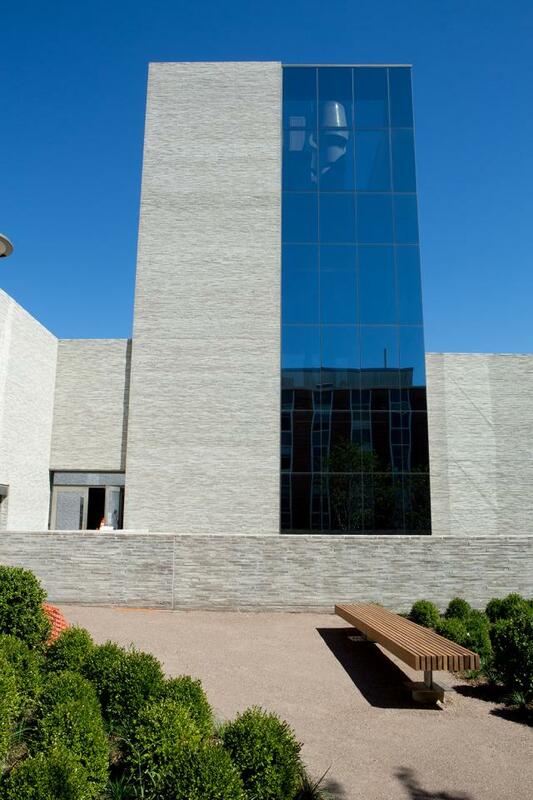 The building features green roofs, rain gardens, advanced lighting controls, heat recovery systems, low-flow plumbing fixtures, rainwater and condensate harvesting, and more. 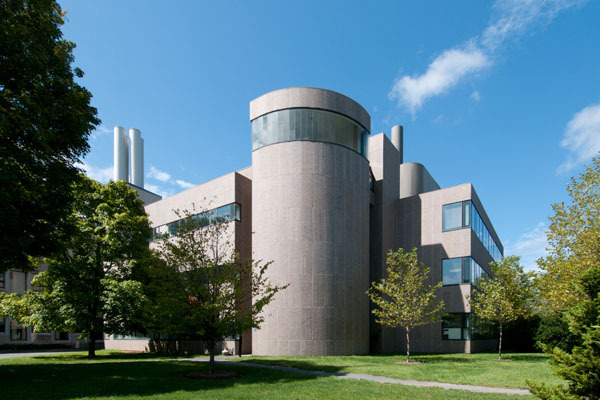 Completed in 2010, Frick Chemistry Laboratory was designed to use 30 percent less energy than building codes require. It also features 216 photovoltaic panels on the roof that provide both shade and a small portion of energy to the building, high-efficiency fume hoods, low-flow plumbing fixtures, a rainwater harvesting system, and more. 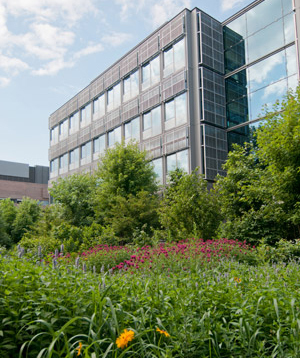 Next to Frick Chemistry Laboratory, there are three rain gardens that provide stormwater management. The gardens are estimated to reduce stormwater volume by about 583,000 gallons annually. 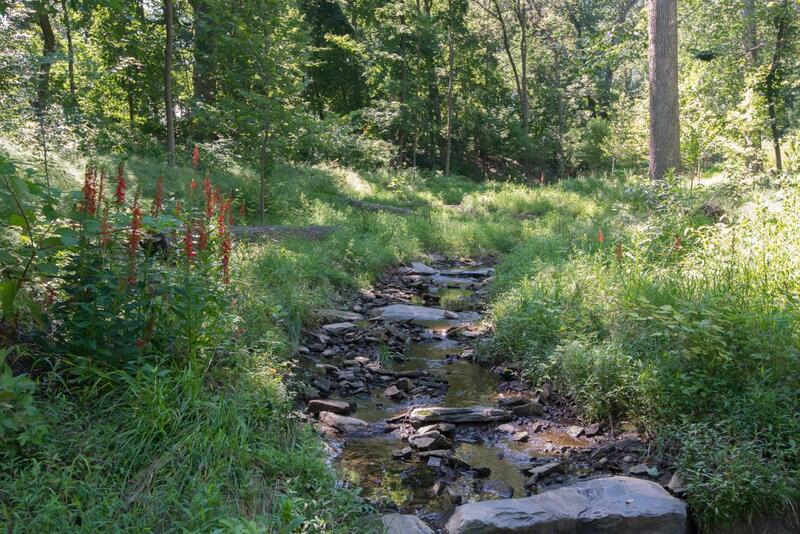 In 2012, a restoration project was completed that reshaped and restored 1,400 linear feet of the Washington Road stream following years of degradation resulting in part from stormwater runoff. Preliminary results from a study of the stream's health indicate a healthier stream environment than its prior condition. 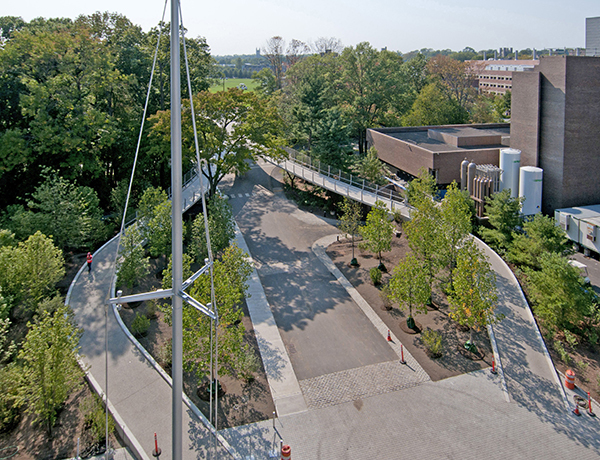 In addition to offering a convenient walkway over Washington Road, Streicker Bridge serves as a research project in material durability. With the goal of identifying structural problems early on that can be translated to bridges generally, hundreds of sensors were integrated into the structure to take measurements on temperature, strain and vibration in the concrete. 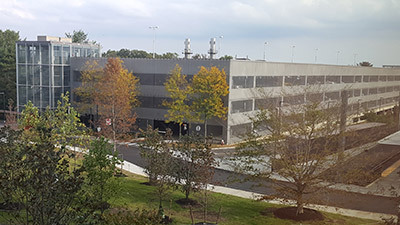 The West Garage features motion- and daylight-sensing LED lighting that maximizes energy efficiency while maintaining safety standards for drivers and civilians. A distinctive feature of the Lewis-Sigler Institute that facilitates indoor climate control is a row of 31 aluminum vertical louvers, 40-feet tall, that turn with the sun. A computerized timer controls the movement and adjusts for the changing seasons. Additionally, Icahn is equipped with low-flow plumbing fixtures. 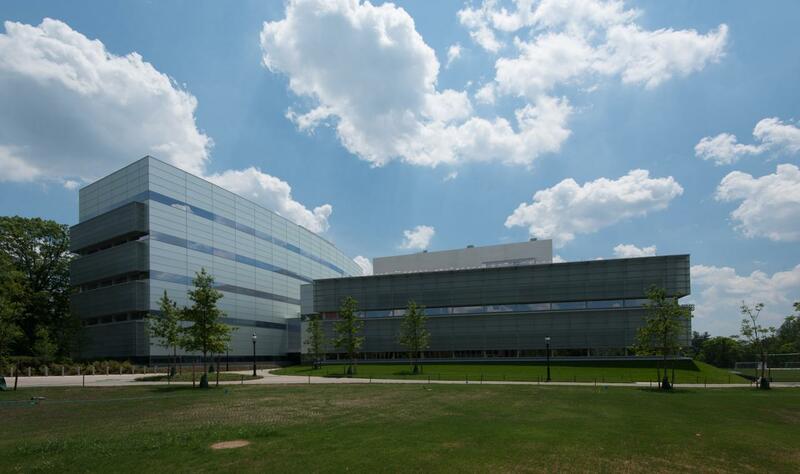 Opened in 2013, the Princeton Neuroscience Institute and Peretsman-Scully Hall is designed to be 30 percent more energy efficient than a standard, equivalent building. Featured are an energy-efficient HVAC system, automatic lighting controls, natural lighting, a stormwater reclamation system, low-flow plumbing fixtures, a high performance exterior facade, and more. A groundwater recharge system underneath the field has the capacity to hold rainwater from a 100-year storm, significantly reducing runoff to local streams and lakes. 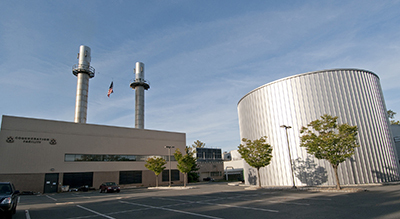 Installed in 1996, the Cogeneration plant plays a key role in reducing University emissions. It efficiently heats and cools campus, and provides about half of the University’s electricity. The plant is among the most efficient in U.S. at 60-80% efficient vs. 25–45% for a conventional plant. 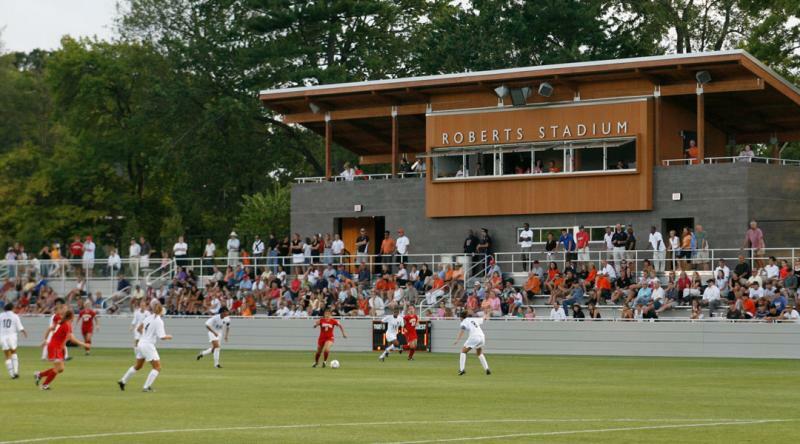 Princeton's solar array, installed in 2012, consists of 16,500 photovoltaic panels on 27 acres. It is connected to the main campus electric power distribution system, and is expected to meet at least 5.5% of the University's annual electricity needs. 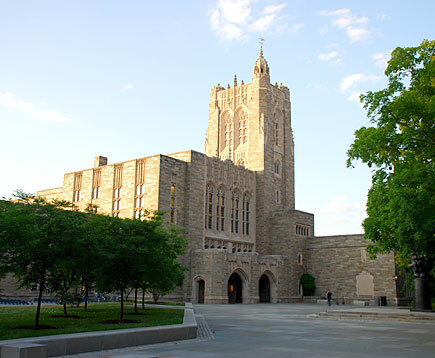 The Princeton Garden Project was founded in 2006 at Forbes College and is overseen by Forbes in partnership with the Office of Sustainability. The initiative aims to provide the Princeton Community with an accessible, welcoming educational space in which to explore organic agriculture, food politics and sustainability through hands-on learning and dialogue. 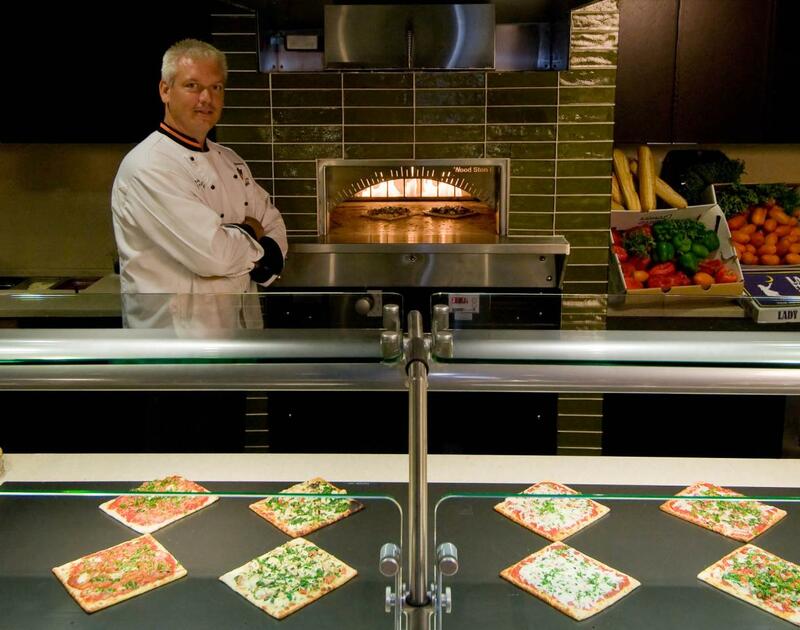 The harvest provides fresh produce for Forbes and other campus venues. 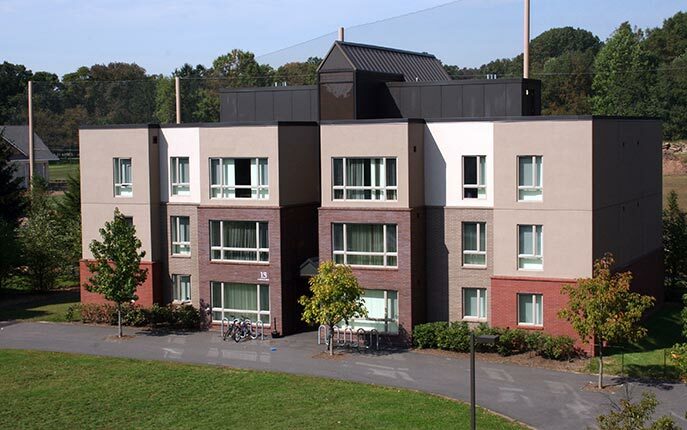 The Butler College dorms, completed in fall 2009, were designed to use 30 percent less energy than building codes require. Other sustainable features include natural lighting, high-efficiency window glazing, and low-flow plumbing fixtures. 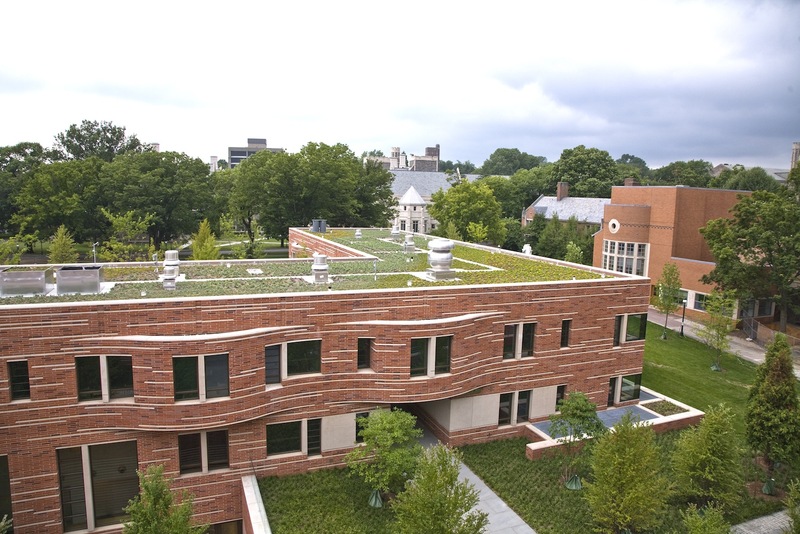 Additionally, more than half of the roof is a green roof, which is under study. Initial research results have demonstrated improved insulation and reduced stormwater runoff. Founded in 2009, the student Princeton BEE Team looks after two hives in a fenced bee yard located near West Windsor Field on Washington Road. The Team's mission is to teach people about beekeeping through events, classes, lectures, and hands-on work in the bee yard. The area is not publicly accessible. Completed in 2015 and certified by the U.S. Green Building Council as LEED Silver, Lakeside Graduate Apartments feature a geothermal heating and cooling system, energy-efficient lighting, sustainable materials, low-flow plumbing fixtures, onsite stormwater management, and more. 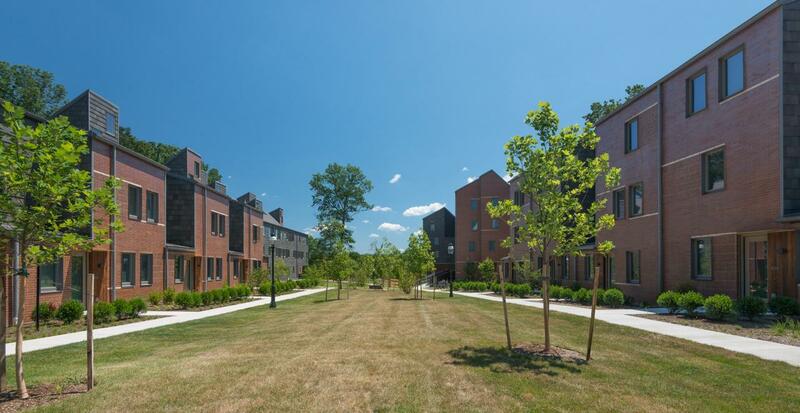 Lawrence Apartments are heated and cooled by 150 geothermal wells, each about 400 feet deep. Utilizing the earth’s natural temperatures, the system acts as a heat sink during summer and a heat source in the winter. These off-campus apartments also feature a community garden. Guyot Hall is home to the Princeton Environmental Institute (PEI), founded in 1994. PEI is a center for interdisciplinary environmental research, education and outreach. It offers educational programs as interdisciplinary courses of study, including the undergraduate Certificate in Environmental Studies and the graduate Certificate in Science, Technology and Environmental Policy (STEP), in partnership with the Woodrow Wilson School. 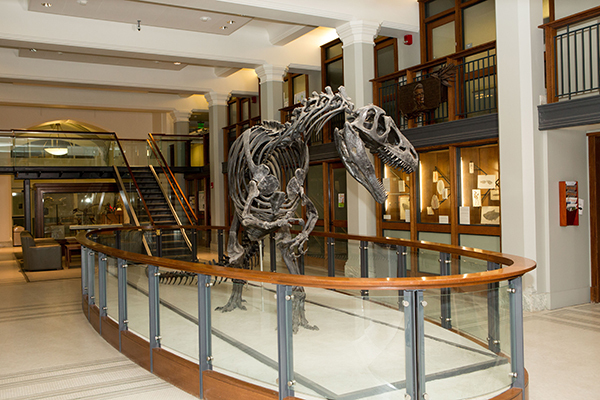 The building, which once included a natural history museum, is equipped with low-flow plumbing features. 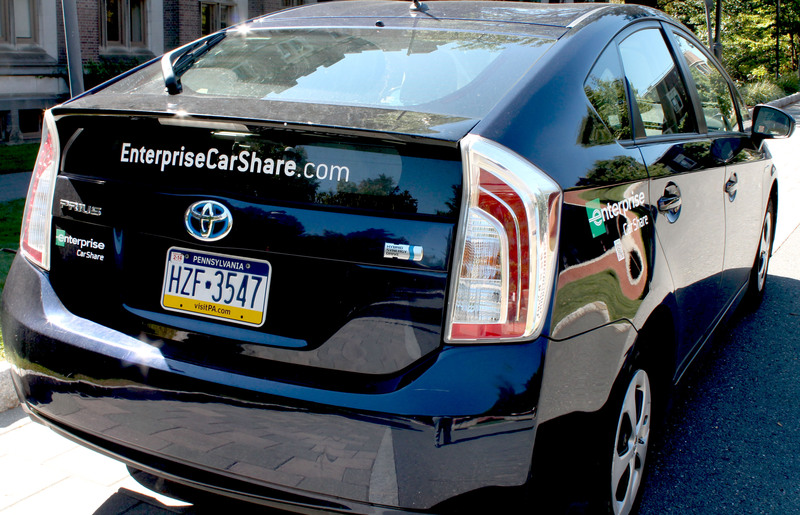 Transportation & Parking Services has partnered with Enterprise CareShare to provide car sharing services for the Princeton University community. CarShare vehicles are located across campus and are available to members 24 hours a day, seven days a week. In 2010, an ultraviolet (UV) treatment system was installed in Dillon Pool, reducing the amount of chlorine needed for disinfection. 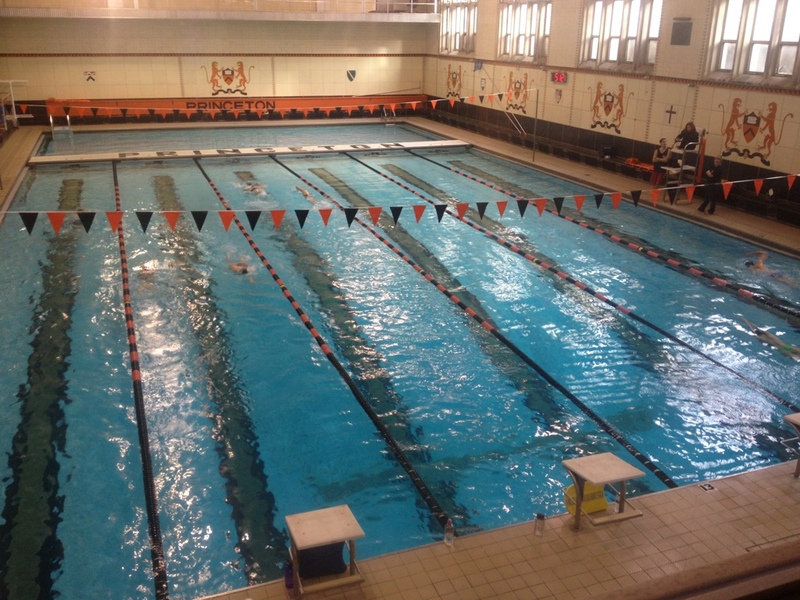 As part of a monitoring project, students have analyzed environmental health implications of the pool area, such as indoor air quality. 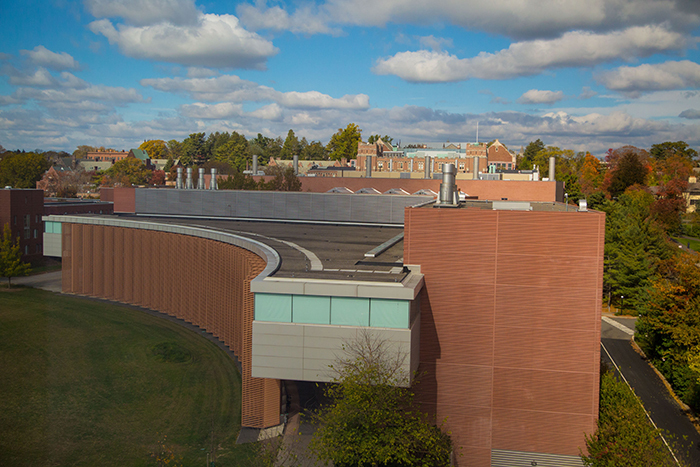 Hoyt Laboratory features energy-efficient heating, cooling and lighting systems, energy-efficient fume hoods, low-flow plumbing fixtures, and more. 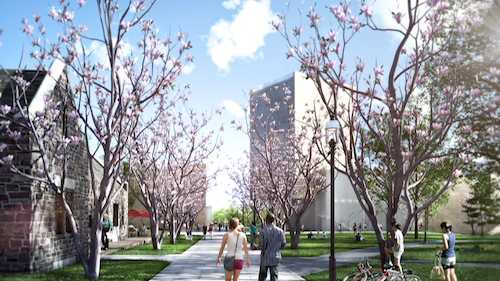 Upon renovation, Firestone Library will feature a new energy-efficient heating and cooling system, energy-efficient lighting, insulated windows, low-flow plumbing fixtures, sustainable building finishes, and more. Established in 2006, the Office of Sustainability works collaboratively with students, faculty and staff to advance sustainability in the culture, and in academics and operations, at Princeton and beyond. After years of planning, the Office of Sustainability has initiated a food waste demonstration project to support the sustainability goals and research and education missions of Princeton University. 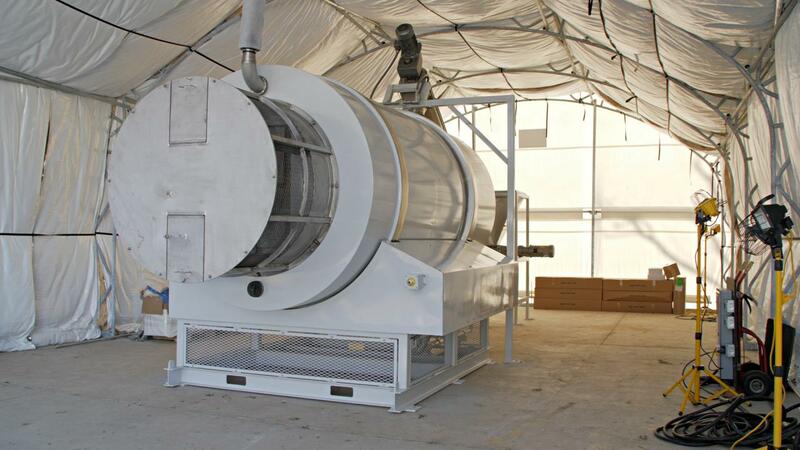 The demonstration project involves the Model 1000 composting system, an in-vessel aerobic digester developed by the company FOR Solutions. The SCRAP Lab is located behind the FitzRandolph Observatory building and will convert a portion of the campus’s food waste into a nutrient-rich soil amendment for campus grounds, while supporting academic research around food waste conversion. For more information, visit the SCRAP Lab Website.